Rediff.com » Business » Was it Narayana Murthy's crusade or just a petty fight? Was it Narayana Murthy's crusade or just a petty fight? While Infosys board gave a clean chit to the Panaya deal, Murthy stands firm on his allegations and said, ‘sadly, it appears we will no longer know the truth’. 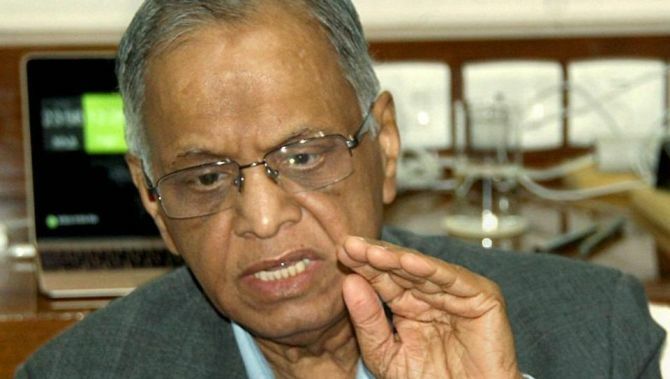 Infosys founder N R Narayana Murthy expressed disappointment that none of the questions raised by him on "poor governance" had been answered by the company's board with transparency. Murthy's comments came after Infosys board, under chairman Nandan Nilekani (considered to be a close confidant of the founder), gave a clean chit to the company's $200 million Panaya acquisition. The board also refused to divulge additional details of the probe, as had been demanded by Murthy. Murthy, in a late evening statement, said that he stood by every question on poor governance raised in his speech to Infosys investors dated August 29, 2017. He asserted that the core question still remained on "how and why the Infosys board approved an unusual and unprecedented severance payment agreement of 1000 per cent (of the standard Infosys employment contracts) to the former CFO...". Murthy had launched an offensive against the previous Infosys management over allegations of corporate governance lapses and had questioned the high severance pay out to former top executives of the company. The stand-off has culminated into a sudden exit of Infosys' then CEO Vishal Sikka followed by erstwhile chairman R Seshasayee. Murthy on Tuesday also questioned why the board did not disclose information (about the severance pay) "proactively and much earlier". "Sadly, it appears we will no longer know the truth," Murthy said in his statement. Announcing its second quarter earnings on Tuesday, Infosys had said that it concurs with the previous findings of an external probe that there is no merit in the allegations of wrongdoing with regard to the Panaya deal. "After careful consideration led by our chairman, the board reaffirms the previous findings of external investigations that there is no merit to the allegations of wrongdoing" Infosys had said. Reacting on the outcome of the board meeting, Seshasayee said, "The company now deserves a period of stability and undistracted focus on the business. I wish the company all the best". It may be recalled that Murthy had demanded that the full report by Gibson Dunn and Crutcher on whistleblower allegations pertaining to the Panaya acquisition be made public. But, Infosys on Tuesday said that after a "careful re-consideration" it has concluded that putting out more details of the probe would "inhibit the company's ability to conduct effective investigations into any matter in the future". Emphasising that confidentiality was key to ensuring the cooperation of whistleblowers and other participants in any investigative process, the company cautioned that any precedent of releasing the full investigation report could impede such cooperation in future. Further, the company asserted that its review had confirmed that "appropriate" and "timely disclosures" were indeed made on severance payments to the former CFO – another issue that had caused a rift between founders and past management. Giving a detailed outline of review undertaken on Panaya issue, Nilekani said: "In light of my review of these matters, I am fully persuaded, as is the entire Board, that the conclusions of the independent investigations are correct."